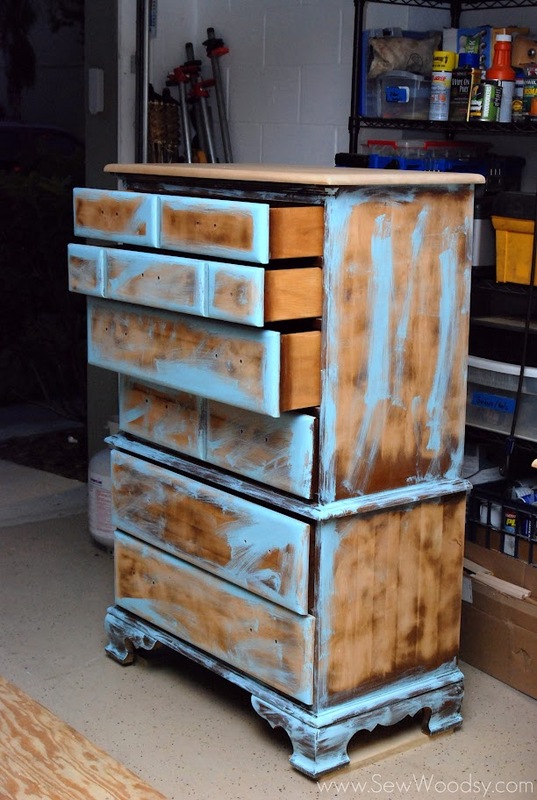 The other day I showed how we sanded and prepped our dressers. Now, let’s fast forward 2 months– the dressers were still sitting in the garage–sanded. Acting as a nice resting place for all the crap in our garage. At this point–I just want to be able to put our clothes in dressers. See we had clothes in our nightstands and ever since we switched out our nightstands we have had to resort to storing our clothes either stuffed in our closet or piled sky high on our only 6 drawer dresser. Earlier last week, I got a burst of energy and decided I would finish these dressers with or without Mr. Woodsy. So, with a damp cloth I began wiping off all the sawdust from the dressers. After months of deliberating, we decided we wanted to paint some blue onto the dressers so when we sand through we will have some specs of blue that come through. So, I began painting on blue–in no particular order or way just slopping it on the dressers. My kind of painting if you ask me. We chose to go with BEHR’s Velvet Morning. It’s what our back wall in our master bedroom is painted and I love the color. The tall dresser was done and on to the long dresser. Mr. Woodsy wasn’t doing his job–all I asked was that he take pictures of the progress. This is the only progress photo from the long dresser! Here it is–all painted up in blue! For a hot minute, Mr. Woodsy wanted to keep our dressers like this and then I reminded him of the bigger picture! Remember, this is our first major furniture painting. We are going along by trial and error. So far it’s all trial and no errors. Stay tuned to see the final product! Disclaimer: Paint was provided by BEHR paints. We were not compensated to write this post. We truly love the product and wanted to share our experience. All opinions are always our own. Cool! I really like that blue and I’m interested to see the final pieces with the blue peeking through!